Looking forward to buy a new car or bike? Confused with the various options available in the market? Droom is your destination to get your dream vehicle now. At Droom, you get largest selection of used and new automobiles, lowest price, verified seller and verified vehicle. It also provides complete ecosystem of various services and tools, which helps in taking a more informed decision. Vehicle Compare: Compare and contrast your favorite car, bike or scooter before buying. You can compare up to 4 vehicles in one time. Affordability Calculator: This tool tells you how much to spend on EMI of a vehicle deducting all your monthly expenses. So, you know the range of the car that you can afford with your current income and expenses. Total Cost of Ownership: Use this tool to calculate and compare the total cost of owning a car. You can compare up to 3 cars side by side. On-Road Price: Know the on-road price of any car, bike or scooter within 10 seconds for free and compare it with other vehicles. EMI Calculator: Know the monthly EMI you have to shell out for taking an auto loan. These are just a few apart from these you can use, Vehicle Research, Price Research, Buy By Budget, Driving School, Auto News, Buyer’s Guide and many more. 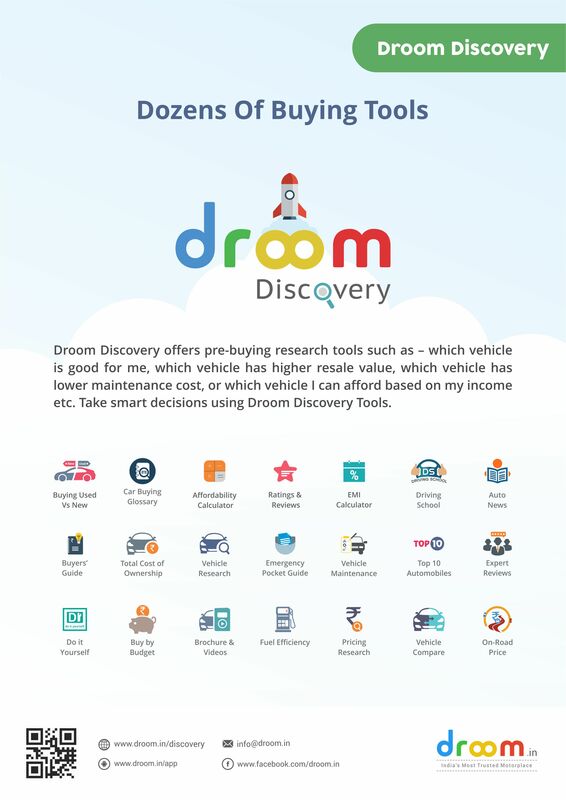 Before you decide of buying your next car or bike, make sure you check Droom Discovery tools to make a smarter decision.